Hard-core astrophotography is very difficult, and requires quite a lot of quite expensive equipment, but, you can do surprisingly much with surprisingly little if you don’t set your expectations unrealistically high. The big problem with the night sky is that it moves. Well, strictly speaking it’s the earth that’s moving rather than the sky, but the point is, stars don’t appear to stand still. Normally when you have a subject that’s dim, you use a tripod and just leave the shutter open for as long as it takes, but since everything astronomical is always on the move, that doesn’t work! The way the pros get around this is with expensive mounts that track the movements of the heavens, opening up the possibility of long exposures. With that problem over-come the pros then run into a whole new set of problems with how noise builds up in sensors over long exposures, so they end up needing some quite advanced techniques and a lot of software and skill as well as the fancy hardware. I did also mention that you need realistic expectations, basically, what we’re aiming for here is shots of large sections of the sky. 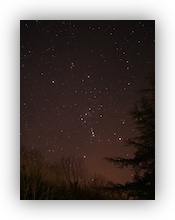 Think a nice shot of a constellation. If you have visions of detailed views of spiral galaxies in your head – get them out now – that’s for the pros with their fancy kit!